Specialist commercial travertine floor cleaning Bristol. Are you constantly struggling with commercial travertine floor cleaning Bristol, does dirt build up in the small pits and larger holes and you can never get rid of some of those stains that have been left to etch the surface of your travertine floor? Your not alone so don’t be embarrassed about it, education is what is needed to keep these stunning commercial travertine floor tiles looking great for years to come. We have cleaned the worst commercial travertine floors and with outstanding results every time, and now those travertine floors get annual maintenance from CleanAndSealUK, making sure they look good all year round and long into the future. Infact we do this with every commercial surface that we either clean or restore. 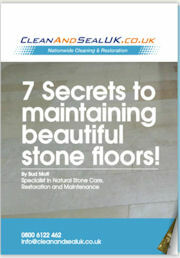 So if you are looking for commercial travertine floor cleaning Bristol you come to the right place. Just click on the free quote button and fill out your commercial travertine floor cleaning Bristol form and we will do the rest. CleanAndSealUK can provide you with the best travertine tile sealing service within our expert floor cleaning service available in Bristol and the whole Southwest – we always work hard to administer consistently good results. You might like your commercial travertine floor to be very shiny without having to polish the travertine or you may like your travertine tiles to have a honed finish with no sheen at all. We can make this happen for you with the wide range of commercial travertine sealers and travertine impregnators that we have available. But the main reason to seal your commercial travertine floors is to protect them from the wear and tear of every day use in such busy environments. Just let us know what type of finish you want for your travertine floor and we will make it happen, along with the best protection possible. Commercial travertine floor restoration Bristol. You will feel totally at ease with our commercial travertine floor restoration Bristol service, we will explain every process to you as we go, same as we do with every other commercial service we offer. Plus we always make sure you know how to look after your restored travertine floor, Whether you want your commercial travertine floor polished or the holes in travertine filled or even cracks filled in just let us know. We can restore your travertine floor to the finish you desire and sealing it to make sure it is protected long after we finish.